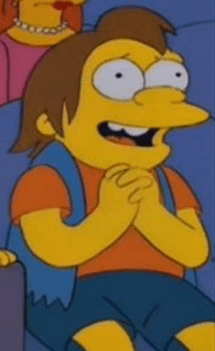 When I tell people how much I like India, their faces often screw up and they hold their stomachs. I may be jinxing myself, but I have never had a dose of Delhi Belly that originated in India. Pakistan is another issue. Visiting there back in 2008, I was so ill I lay on the floor of my hotel bathroom in Karachi wrapped only in a towel in a pool of sweat and started to write my will on hotel stationery. I stopped because I realized all I had was a German car the bank mostly owned and a nice handbag to offer my loved ones. Back to India. I write this post from Mumbai, one of the world’s most interesting cities. 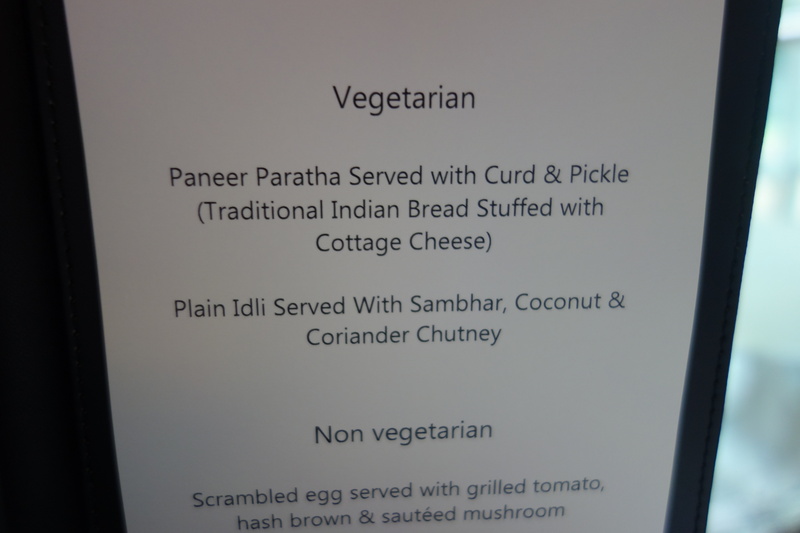 My obsession with Indian cheese is well documented, so imagine my excitement when I saw paneer on the menu for BREAKFAST at the Grand Hyatt Mumbai. 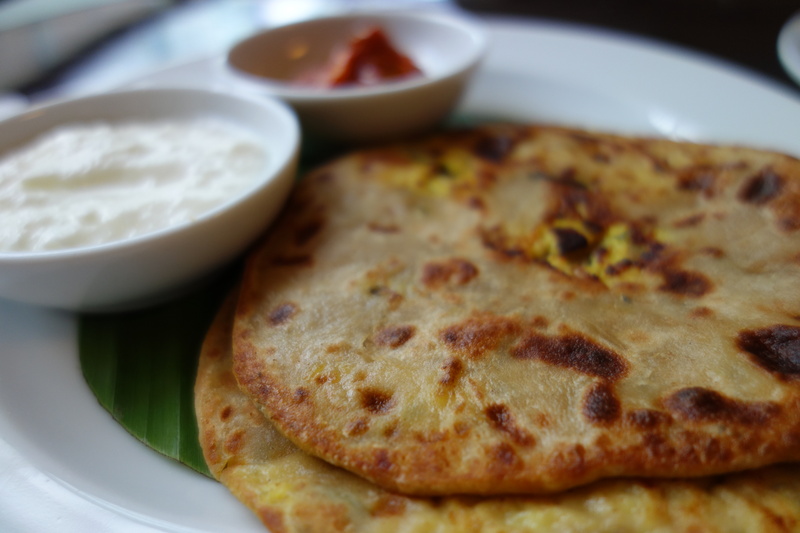 Parantha is an amalgamation of the words parat and atta which literally means layers of cooked dough. 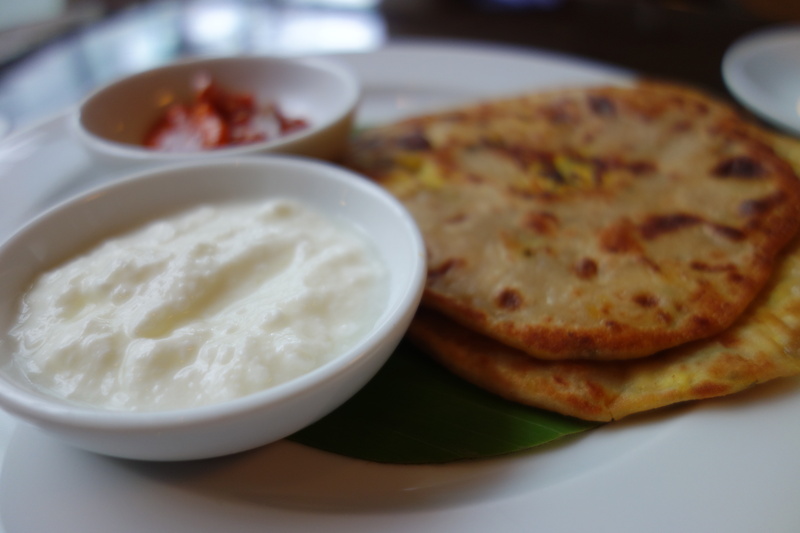 Sides which go very well with paratha are curd, fried egg, omelette, Qeema (Ground beef cooked with vegetable and spices), Nihari (a beef dish), zeera aloo (potatoes lightly fried with cumin seeds), daal, and raita as part of a breakfast meal. It may be stuffed with potatoes, paneer, onions, qeema or chili peppers. The curd with it is a post in itself. I love India’s commitment to curd. While I struggled to get through the feast, the cheese, curd and pickles worked perfectly. Curds are a dairy product obtained by curdling (coagulating) milk with rennet or an edible acidic substance such as lemon juice or vinegar, and then draining off the liquid portion. It’s common to see it accompany Indian dishes. I have another 30 odd hours in Mumbai. Better get eating! 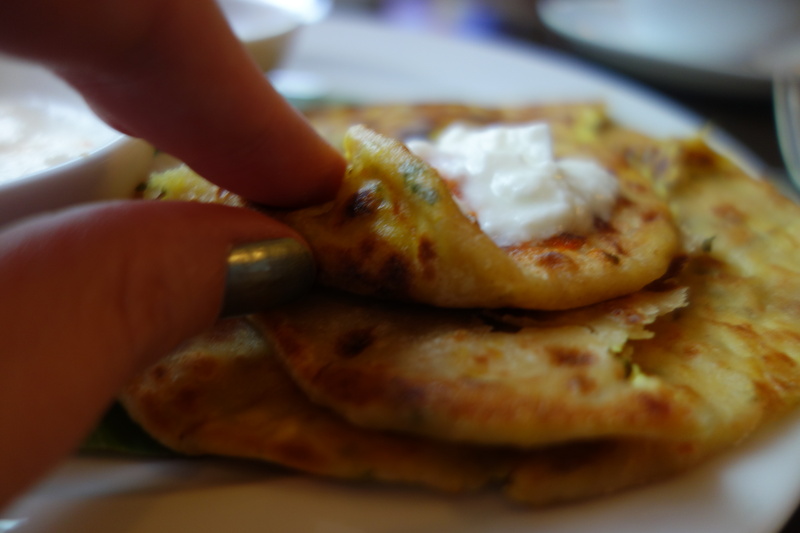 My favourite are parathas stuffed with radish. My neighbour in Bombay makes them for me every time I go home on vacation. Yum!